Community Action Partnership of San Luis Obispo (CAPSLO) director of homeless services Dee Torres has lost her slander case against Mike Brennler, a private investigator who had been working with CalCoastNews on news articles about abuses of the homeless. San Luis Obispo Superior Court Judge Barry LaBarbera ruled Friday, dismissing Torres’ case and noting that Torres is a public figure. Also, he wrote, it did not appear likely that Torres would be able to prove her case. CalCoastNews had been publishing an ongoing series of articles on abuses of the homeless, and reported that Torres had taken gift cards donated for the homeless and used them for herself, her family, and others. Brennler was investigating those reports when Torres sued him for slander, asserting that he defamed her by telling one of her ex-husbands that she stole money from clients at the homeless shelter. Included in Torres’ filing were “Does 1-100… radio broadcasting stations and individuals and individuals associated with those stations,” “online news agencies in San Luis Obispo County” and sources who may have talked to reporters. Brennler filed an anti-SLAPP (Strategic Lawsuit To Prevent Public Participation) motion to dismiss Torres’ lawsuit, citing the California law protecting against lawsuits intended to prevent people from discussing matters of public interest. In addition to the slander suit, CAPSLO threatened to sue whistle-blowers who revealed specific abuses of homeless people. Torres’ attorney Roy Ogden argued his client was not a public figure; that Brennler made the statement with malice; and that one of the people interviewed was lying in order to hurt Torres, the source’s former girlfriend. Stew Jenkins, Brennler’s attorney, argued that Torres was unable to prove malice or that the allegations of theft were untrue. In order for a public figure to prove slander, the alleged statement must be provably false and said with actual malice. In addition, Jenkins noted the scores of sources made allegations of misappropriation of funds or misdeeds against the homeless. If an anti-SLAPP motion is successful, the plaintiff is generally ordered to pay the defendant’s attorney’s charges and court fees. “Defendant shall prepare, file, and serve a proposed judgment in his favor,” LaBarbera wrote in his ruling. Reading Torres’ op-ed in the Tribune felt like I was seated at the MadHatter’s Tea Party, where no means yes and yes means no. However, Dave Congalton’s commentary (6:05 PM) on the Torres op-ed knocked it out of the park. He made several crucial points. The two I was especially glad he made were when he brought up the witness intimidation, and when he described the horrible Topix posts about Velie and others. In addition, Congalton made a clear point that Torres LOST in the court case, and that, no matter how she wants to spin it, it doesn’t change the truth. I wonder what “Hill” she had to climb to get the Tribune to actually print this??! “Ms. Torres’ efforts failed as they should have. Her efforts to wag her fingers at the judge and everyone else is merely a distraction… she didn’t have a case. In order to proceed, she had to prove to the judge that she actually had a chance of winning the case… and that effort was underwhelming. To paraphrase the judge, Ms. Torres is a public figure and CAPSLO’s very public interactions with our community is ‘of public interest.’ As an aside, I do believe it is in the public interest to report on interesting developments at CAPSLO, Cal Poly or any other institution that serves our community. Media people (including those at the on-line Cal Coast News) have an obligation to shine a light on the arrogant, the powerful, and institutions when they appear to have gone off track and educate everyone on both sides of the issue. Giving Ms. Torres this amount of ink seems a bit one-sided. Media people need to take an active — if not activist stand — on issues within our communities… and lets remember that everyone with a ‘cell phone’ can report on what they see. Bloggers and on-line news sources have their role… to cover those topics others are too afraid to cover. Speaking of Hill, where is the boy at times like these? I figured he’d be pounding out some more emails by now. His handlers are keeping him in a box, so he doesn’t further harm his own reputation. Don’t we wish his handlers would keep him in a box. You obviously need to see an eye specialist. I recommend Dr. C. Wright. I’m happy the case was tossed out! I think most of us knew it would be, I don’t understand CAPSLO not realizing they have one conniving, manipulating, and lying director running their Homeless Services! Do they not worry about how the community will respond in their failure to act? 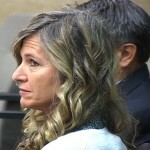 Dee Torres has lied on court documents, do they really believe she only lies to the courts? Lies come easy for Ms Torres, come on CAPSLO what else has she lied about? Has she lied about stealing? Has she lied about having employees terminated, employees who had gone to CAPSLO with concerns, did she create false statements in order to have people terminated? She lied about her ex and she lied about spending gift cards with her family, seems to me her first language is lies! The court document mentioned problems at a prior employment , what was the reason for that, another lie perhaps?? CAPSLO, regardless of what you believe, Ms Torres has huge character flaws and zero ethics! I think the fact that she lied on court documents is cause for immediate termination! You need to review everything she has ever told to you! There is one thing Ms Torres is very good at, and that’s making CAPSLO look a fool! Tell us how you justify or approve of her lies? It’s there in black and white for everyone to see, how are you going to pretend this never happen??!!! What excuse will justify her lies to the courts? Better yet, what excuse will justify your approval of her lies in court?! Here’s the rub, karma. They can’t let her loose. Torres knows all about CAPSLO’s misdeeds. Fabrications created to land governmental funding, in particular. If Biz keeps her close, CAPSLO can retain some cover. ITA. CAPSLO has turned a blind eye to the unforgivable actions carried out by Torres on behalf of CAPSLO. In many ways, Dee Torres and her treatment of CAPSLO’s homeless clients now define CAPSLO itself. For CAPSLO to become critical of CAPSLO now equates with CAPSLO becoming critical of itself, and there are far too many ego-laden politicians involved with CAPSLO for that to be allowed to ever occur. Great discussion between Congalton and Velie/Blackburn. It sounds like there are quite a few more stories to be broken in the near future. I’m glad Karen made it a point to describe the intimidation CAPSLO pulled against the CAPSLO workers and others who were willing to come forward on record. That is too vile for words. So when will Mike Brennler be on Congalton ? Karen and Dan will be on tonight (Wednesday) at 5:05. Mike and Stew will come on at a later date — after they’ve filed the paperwork for Dee to reimburse.